Got a package from my brother, Dan, a couple weeks ago. 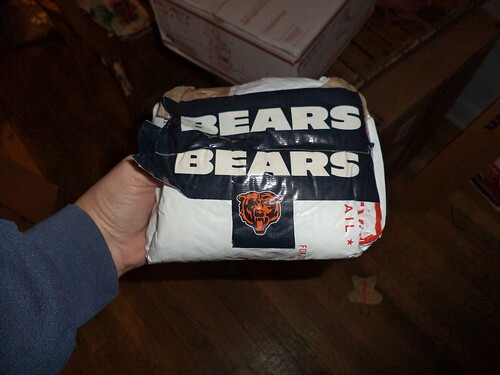 It started with a Priority Mail box that had Bears duct tape on the ends. I didn't think to take a photo of the box when I opened it. The duct tape on each end meant I had to actually destroy the box to get into it. I dumped out the contents and found this. 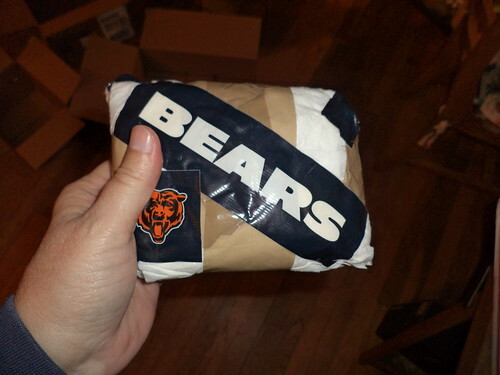 It's a Priority Mail envelope which has been folded around something and sealed with Bears duct tape. (My brother is a big Bears fan.) At that point, I knew something was up. This is obviously something I must document. 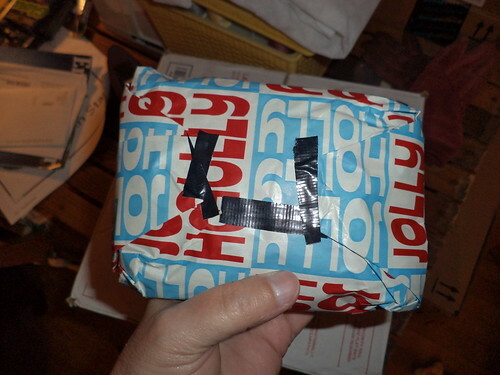 I had to get the scissors and cut through the duct tape to free enough of the packaging to dump out the contents. This was inside. It was yet another bag only this bag was held together with brown tape and Bears duct tape. We're down a couple sizes now, from the original package size. I'm wondering, at this point, just what he sent. Could it be a gift card and I'm going to have to go through 15 more layers? I had to cut this layer to get enough of the packaging free to see what the next layer was. "Couldn't you feel the M&M's?" I hear you asking. 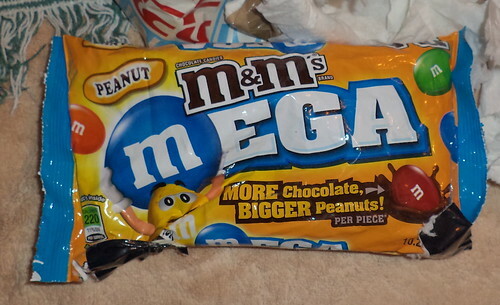 He had compressed the bag so tightly and added all the layers so, no, it didn't feel like a bag of M&Ms. This is hilarious. Of course, you know, I must "retaliate".